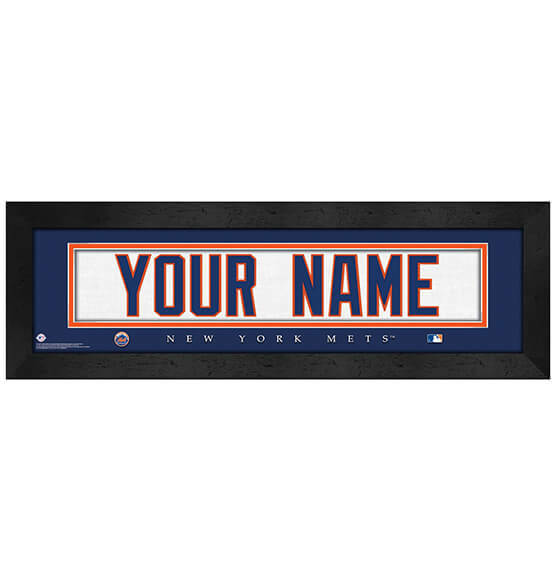 Add a first name, last name or affectionate nickname to our New York Mets MLB Personalized Nameplate Framed Art. Designed to look like the back of a Mets jersey, you can feel like part of this historic American League East franchise. Show your true fan status with this custom wall art print that is made to order up to 12 characters. Great for home, office or your fan cave, this high-quality print is protected behind glass, featuring vibrant team colors and team logos. The elegant black wood frame looks great and comes ready to hang with a sawtooth hanger. Need a gift that's a guaranteed four-bagger? Look no further than this personalized nameplate from PersonalizedThings by Exposures.